We present new Hubble Space Telescope (HST) observations of NGC 300 taken as part of the Advanced Camera for Surveys Nearby Galaxy Survey Treasury (ANGST). Individual stars are resolved in these images down to an absolute magnitude of M F814W = 1.0 (below the red clump). We determine the star formation history of the galaxy in six radial bins by comparing our observed color-magnitude diagrams (CMDs) with synthetic CMDs based on theoretical isochrones. We find that the stellar disk out to 5.4 kpc is primarily old, in contrast with the outwardly similar galaxy M33. 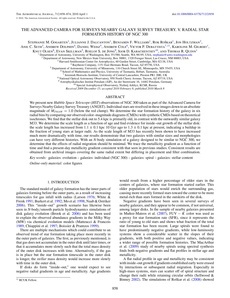 We determine the scale length as a function of age and find evidence for inside-out growth of the stellar disk: the scale length has increased from 1.1 ± 0.1 kpc 10 Gyr ago to 1.3 ± 0.1 kpc at present, indicating a buildup in the fraction of young stars at larger radii. As the scale length of M33 has recently been shown to have increased much more dramatically with time, our results demonstrate that two galaxies with similar sizes and morphologies can have very different histories. With an N-body simulation of a galaxy designed to be similar to NGC 300, we determine that the effects of radial migration should be minimal. We trace the metallicity gradient as a function of time and find a present-day metallicity gradient consistent with that seen in previous studies. Consistent results are obtained from archival images covering the same radial extent but differing in placement and filter combination.